Unique for the approach to NLP of NLP Delhi is that we do statistical research into the question: how well does NLP work? Besides this question we also research to see how well the Neurogram® fits people’s perception of their personality. The results are very encouraging. We have done two different experiments in regard to NLP. In the first one we looked at how well NLP works in order to surmount psychological problems. The results are that for people who on average had more than 800 problem days in the last 1000 days (so ⅘ of their life was miserable) in 80.3% of the cases with only a few weeks of NLP coaching the number of problem days were halved. This means a huge improvement in the quality of their lives. In the second experiment we looked at how people who had no serious psychological issues improve on an already pretty nice life. The results are that with the NLP training programmes 83% of the participants improved the quality of their life significantly. The experiment in the Neurogram® shows that in 93% of the cases the personality type that the computer calculates based on our Bayesian model for personality fits people’s idea about their own personality. In that sense the Neurogram® model is a highly reliable way of mapping personality. 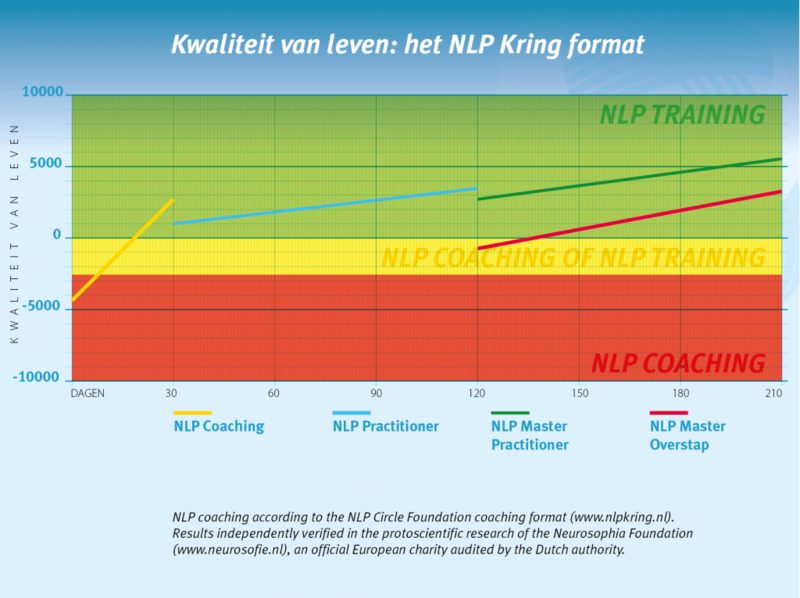 the red line represents people who have done an unlicensed NLP Practitioner course. You can see that by doing an unlicensed NLP Practitioner course they have lost out on quite a lot of quality of life. Fortunately, by switching from an unlicensed NLP course to the Licensed NLP Master Practitioner™ they show a huge improvement in their quality of life and make up for some of the original gap.